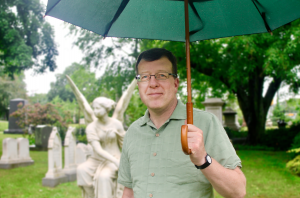 This summer and fall, I’ve been lucky to garner a whole bunch of press attention for the upcoming plays at Mount Auburn Cemetery. We had some great readings in September and now we have full productions scheduled for June and September of 2019. The Boston Globe ran a piece in the Metro section about the project. Which was super cool because it wasn’t in the Arts section. I love it when we get coverage in the Arts section, don’t get me wrong. But it’s a good sign when we show up on in the Sunday Metro section. Here’s hoping we keep getting the word out next year, when the shows are ready to open.